1857 - First recordings of Catholics in the Algona area. 1872 - The first church of St. Cecelia was built. 1880 - First Resident Priest, Father McCaffrey, stationed in Algona. 1884 - The south half (or old part) of Calvary Cemetery deeded to Denis McCaffrey. 1887 - June - Calvary Cemetery land deeded to John Hennessy, Bishop of Dubuque. 1892 - July - The second St. Cecelia Church was built. 1894 - June- Dedication of the second St. Cecelia Church. 1913 - May - Calvary Cemetery land deeded to St. Cecelia's Roman Catholic Church. 1923 - January - The North half (or new part) of Calvary Cemetery deeded. 1927 - The Academy (now Seton School) was built. 1930 - October - The Golden Jubilee of the parish. The Rectory was built. 1948-1951 - Construction and dedication of the Convent. 1948 - October - St. Ann Hospital built. 1953 - March - Construction of the present St. Cecelia Church began. 1954 - September - Dedication of the new church. 1959 - Garrigan High School was built. 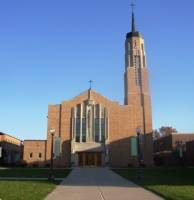 1967 - September - St. Ann's ownership transferred to the Sisters of St. Benedict of Madison, Wisc. 1972 - January - St. Ann's ownership transferred to Kossuth County and renamed Kossuth County Hospital. 1976 - Rectory addition constructed. 1979 - July - A tornado hits Algona causing $25 million in damage. Many lost homes, businesses and loved ones.